LONDON JULY 2011. Niklas Eklund, general partner at RECAPEX will also join Wellington Partners as a Venture Partner. Pan-European venture capital firm Wellington Partners has appointed another high-calibre serial entrepreneur as a Venture Partner: Niklas Eklund. The Swede will share his vast experience in the Digital Media Sector with the portfolio companies and will help Wellington Partners to expand its footprint in the Nordic countries and across the rest of Europe. Over the past 20 years, Niklas has built and internationalized a range of companies within reservation systems, revenue management, online marketing and web publishing; amongst others he was the co-founder and CEO of Wellington portfolio company Livebookings. Niklas describes himself as a ‘computer software geek and wizard turned businessman’ as he started his career at the age of 15. His achievements in building internationally successful companies have been recognized by various industry awards. Niklas Eklund is the 15th Venture Partner - eight are based in North America and seven in Europe. Besides Niklas, high-calibre entrepreneurs like iPIN/Valista/Paymo (now Boku) co-founder Alexandre Gonthier, LinkedIn Co-founder Eric Ly and former Last.fm COO Spencer Hyman are focussing on the Digital Media sector - a core investment area of Wellington Partners for almost 15 years. All Venture Partners advise and support portfolio companies in their areas of expertise on strategic planning, key executive hires and provide a crucial network for business development. 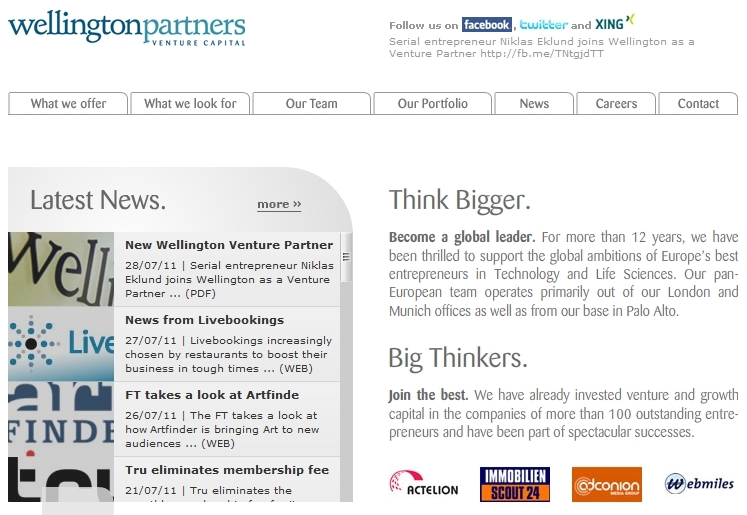 Wellington Partners is one of the most successful pan-European venture capital firms. With some € 800 million under management and offices in London, Munich, Palo Alto and Zurich, the firm invests into companies throughout Europe that have the potential to become global leaders, in the areas of Digital Media, Cleantech, Electronics, Software and Life Sciences. Since 1998, Wellington Partners has invested in more than 100 European companies, including now publicly traded Actelion and XING and privately held companies like Adconion, Alando (acquired by eBay), Ciao (acquired by Microsoft), Glo, Livebookings, Qype, and Spotify. For more information please visit www.wellington-partners.com.